Grapevines from Bordeaux were first brought to Los Angeles in 1833 by French winemaker Jean-Louis Vignes, the founder of California’s wine industry. As Italians migrated to Los Angeles, many started to make wine. In 1917, Santo Cambianica founded San Antonio Winery, dedicating it to his patron saint St. Anthony. Purchasing grapes from local vineyards, he made wine in the facility located on Lamar Street on the east side of downtown Los Angeles. With a trolley stop just in front, Cambianica opened a storefront where people would bring their jugs to be filled daily just as they did in Italy. When Prohibition began in 1919 with the passing of the Volstead Act, Cambianica was able to keep the doors open by producing sacramental wines for the church. Then in 1936, Cambianica’s nephew Stefano Ribioli arrived from Lombardy, Italy at the age of 16 to apprentice under his uncle. As Cambianica had no children, Riboli and his wife Maddalena, who married in 1946, took over in 1956. Today, Stefano Riboli is 96 years old and his wife Maddalena is 95 years old, and they have been married for 71 years. They have three children — Santo, Cathy and Steve — who took over running the winery in the 1980s. And today, the fourth generation of Riboli’s are running the business. 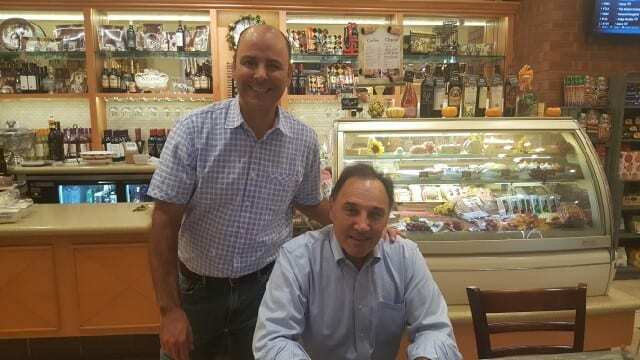 Anthony Riboli, son of Santo, started in 1998 and is the winemaker. Anthony runs the family business with three of his cousins but his parents, grandparents and relatives are still involved. “We do not retire in our family,” Anthony said. 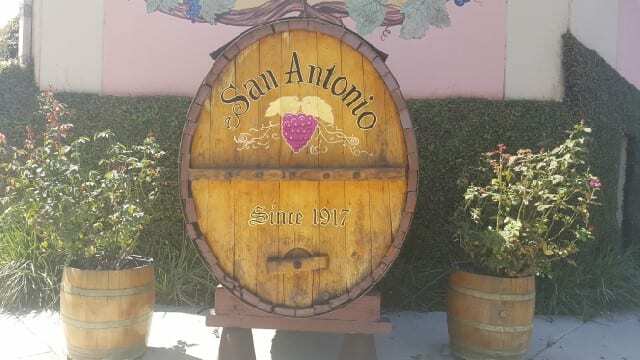 San Antonio Winery has been in the same place since 1917 although they have expanded. Today the Lincoln Heights neighborhood is primarily industrial with large warehouses but at one point it was surrounded by agriculture. Over the years, the Riboli family expanded their property. As they continued to grow, the wine processing was moved north in the 1960s, and in 1972 the original winery space was converted to a restaurant that features Italian recipes from Maddalena and bustles with visitors daily. In the 1980s, the Riboli family purchased land in Monterey and planted vineyards in Arroyo Seco and Santa Lucia Highlands. They also purchased a vineyard along the Silverado Trail in the Rutherford AVA of Napa Valley in 1986. While they have been buying fruit from Paso Robles for 30 years, today they own five vineyards in Paso Robles with three in El Pomar AVA and two in Creston AVA. They built a winery in Paso Robles and their first vintage there was in 2016. Currently, the red wines are fermented and barrel aged in Paso Robles, and the white grapes are pressed in Paso Robles and then brought to the San Antonio original location for vinification. 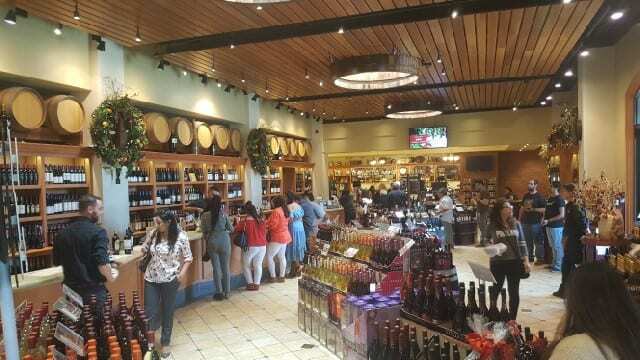 Under San Antonio Winery, there are more than 20 brands. Maddalena, named after Anthony’s grandmother and his daughter, is the largest production of wines (50,000 cases). With wines at $15-$20, Maddalena wines come from their vineyards in Paso Robles and Monterey and offer a range of varieties – cabernet sauvignon, merlot, zinfandel, Riesling, chardonnay, muscato canelli and pinot grigio. The San Simeon label (approximately 25,000 cases) is the reserve level of wines at $20-$25. Viognier, chardonnay, sauvignon blanc, pinot noir, merlot, petite sirah, syrah and cabernet sauvignon are all bottled under this label. The Opaque label are the big dark wines, zinfandel, malbec and petit Verdot, from Paso Robles. With fewer than 3,000 cases produced, the Opaque wines are $30 each. The Riboli Family wines are limited production (500 cases) of $60 cabernet sauvignon from their Rutherford vineyard in Napa. The altar wines and cooking wines that are still produced are part of the San Antonio Winery label. But under this label, they also offer higher-end blends including the 2014 Centennial Blend from Paso Robles. A blend of five grapes from the El Pomar and Creston AVAs, this limited-edition wine celebrates the legacy of San Antonio Winery. Of the Riboli family’s other brands, they also produce the Stella Rosa wines from Italy and own an import and distribution company. 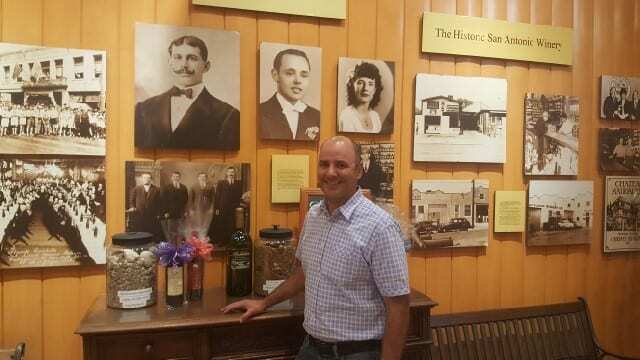 After 100 years, San Antonio Winery is a part of Los Angeles and the wine industry’s heritage. This entry was posted in Wine and tagged 100 year anniversary, Anthony Riboli, downtown LA, los angeles winery, Napa Valley Register, Riboli Family Wines, San Antonio Winery, Wine by Allison Levine.